After about seventeen years of it, my family gave up on me. 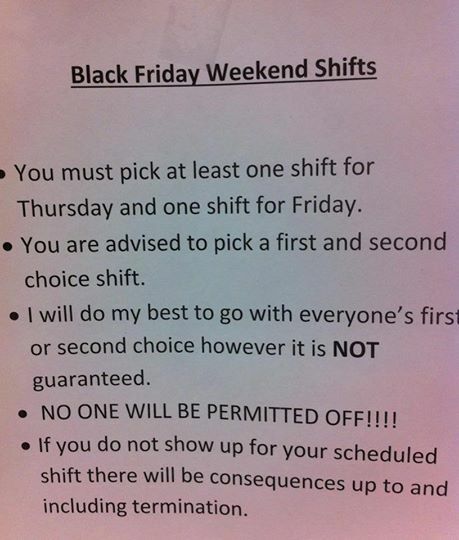 Everyone has a family, including retail workers. Most places do not need to be open. At best, people are making everyday purchases that could have been acquired the day before. Now to work out, clean, gather firewood, and bake! If the Regis salon had its choice, the store in the Grand Traverse Mall would not have opened its doors on Thanksgiving. But the alternative was to pay the mall a fine of around $500, the salon’s manager told MLive and The Grand Rapids Press. “We had to be open all the required hours,” said the woman, who declined to give her name. You really have to read the whole story to fully appreciate the depravity. It gets worse. For those merchants that only have one person in the store, that person cannot take potty breaks or the store gets fined for being closed. The only way to stop this is to not support it with patronage. Here in Germany, shops remain firmly after 6pm or 7pm weekdays, and all day Sunday. About four times a year, there are special Sunday shopping days, where the shops are open from 1pm to 6pm. The local church always puts out a sign that says ‘those who would shop on a Sunday will soon find themselves working on a Sunday’. They have a point. One of my husband’s groomsmen was a college friend of ours, John, who moved to Germany in the early 1990s and married an East German woman named Sabine. They lived in what was once East Berlin; I went to visit them one month around 1998 and on Sundays we always went out to brunch. The brunch restaurants were nearly the only thing open on Sundays, and people sat for *hours* having their meal and coffee and chatting. I was utterly unused to that pace and I had to adjust a bit, but Sabine told me things were beginning to change to a more “West German” frenetic (by Eastern standards) pace of life after reunification.